Be led through gates normally locked and doors usually bolted to learn of ghostly experiences and historical facts in a fascinating tour of one of the most haunted and historic cities in Britain. The hugely popular Historic Ghost Walk will lead you through gates normally locked and doors usually bolted to learn of ghostly experiences and historical facts in a fascinating tour of one of the most haunted and historic cities in Britain! Walks start at Elgar Statue, Worcester High Street and finish at Worcester Guildhall, and last between 1½ and 2 hours. Please note that parts of the walk are not accessible to wheelchair users. 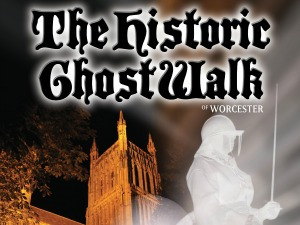 Worcester Live reserves the right to cancel a Ghost Walk – please call the Worcester Live Box Office in advance to confirm if a Ghost Walk is running. Booking is advisable.